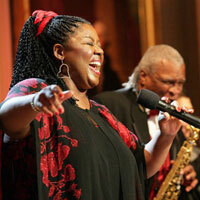 Dazzling and dynamic, Lisa Henry represents the best of Kansas City’s current Jazz era. Lisa has entertained many around the world with her voice and energy. She’s performed in numerous festivals, venues, and tours. Her talents have led her to stages in Argentina, South Africa, and Madagascar. Lisa has also appeared on numerous audio recordings, many of which were recorded here in Kansas City. Lisa is also comfortable in the classroom. She has given workshops at many universities both here in the United States and overseas. Lisa has received honors for her talent including being first runner-up in the Thelonious Monk International Jazz Vocals Competition and being named International Jazz Ambassador to Africa. KCYA awarded Lisa with the Lighton Prize for teaching excellence in 2008.